The Sanya Royal Garden Resort - Grand Building is located in the city of Sanya, known for its beaches and family friendly atmosphere. Situated 15 km from downtown Sanya, this 4-star hotel is conveniently located within walking distance to Dadonghai Beach, and 3 km from both The First Market and Luhuitou Lizu Wenhua Tourist Zone. The hotel is also situated 40 km from Sanya Phoenix International Airport. 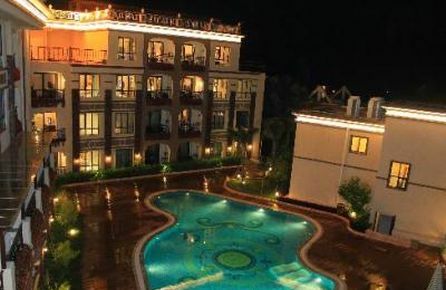 Sanya Royal Garden Resort - Grand Building has 15 bright and spacious guest rooms featuring elegant décor, crisp white linens, and modern amenities. Each comfortable and well-appointed room comes equipped with a private bathroom, LCD TV, sitting area, and wireless internet access. The hotel features scenic views of the Dadong Sea and boasts superior service and facilities, including an outdoor swimming pool, currency exchange, guided tours of local sites, airport transfer for convenience, and shops for souvenirs. Sanya Royal Garden Resort Grand Building in Sanya! The Tujia Sweetome Vacation Apartment Serenity Coast Resort is located on the shores of the Dadong Sea, in the city of Sanya. The hotel is situated just 2 km from the downtown area, where a variety of shopping, dining, and entertainment options are located. The hotel is also situated 45 km from Sanya Phoenix International Airport. Tujia Sweetome Vacation Apartment Serenity Coast Resort has 38 bright and spacious guest apartments featuring modern décor, comfortable furnishings, and all the luxuries of home. Each well-appointed apartment comes equipped with a private bathroom, spacious living room, kitchen, and internet access. Tujia Sweetome Vacation Apartment Serenity Coast Resort in Sanya! 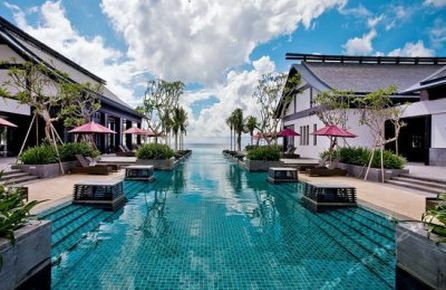 The Banyan Tree Sanya is located in Luhuitou Bay in the city of Sanya, just 4 km from Jiefang Road, home to many of the area's most popular shops and restaurants. The hotel is situated 2 km from Dadonghai Beach, 3 km from The First Market, and 13 km from Sanya Phoenix International Airport. Banyan Tree Sanya has 49 comfortable and spacious guest rooms featuring modern décor with colorful Chinese accents. Each bright room comes equipped with its own private pool, private bathroom, LCD TV, sitting area, and free wireless internet access. Guests of the hotel will appreciate the wide range of recreational activities to enjoy, including bicycle rentals, outdoor swimming pool, private beach, hot tub, sauna, steam room, fitness center, spa with massage services, and a casino. The hotel also offers a number of services to make each guest's stay more convenient with babysitting, on-site salon, and choice of two restaurants serving both Thai cuisine and international dishes. Banyan Tree Sanya in Sanya! The Sanya Yalong Bay Sintra Suites Hotel is located just steps from Yalong Bay in the town of Sanya, 20 km from the center of the city. The 5-star hotel is conveniently situated near a number of local attractions, including Under Water World, Butterfly Park, and Yalong Bay Golf Club. 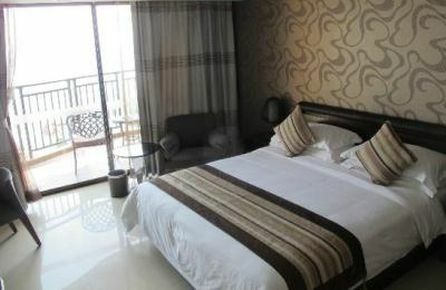 The hotel is also situated 35 km from Sanya Phoenix Airport. Sanya Yalong Bay Sintra Suites Hotel has 62 bright and spacious guest suites featuring classic contemporary décor and all the amenities of home. Each comfortable suite comes equipped with a private balcony, private bathroom with separate shower and bathtub, kitchenette, washing machine, and free wireless internet access. The Sanya Yalong Bay Sintra Suites Hotel offers guests impeccable service and an impressive array of recreational activities, outdoor swimming pool, and peaceful garden. The hotel also offers a business center, babysitting service, and 3 restaurants serving a variety of cuisine to suit anyone's tastes. Sanya Yalong Bay Sintra Suites Hotel in Sanya! The Shenhang Apartment Phoenix Island is located on the picturesque Phoenix Island in the city of Sanya, an area renowned for its beaches and beautiful views. Situated just 2 km from the assortment of popular shops, restaurants, and entertainment options of downtown, the hotel is the perfect place for guests to experience Sanya. Shenhang Apartment Phoenix Island has 80 bright and spacious guest rooms featuring simple yet elegant décor and tiled floors. Each room comes equipped with a private bathroom, LCD TV, refrigerator, balcony, and free wireless internet access. Guests are encouraged to make use of the hotel's superior features and services, including available water sports, boat rentals, bicycle rentals, guided tours of local sites, outdoor swimming pool, peaceful garden, and concierge service. The hotel also features on-site valet parking, a shuttle to area destinations, and an airport transfer service for guest convenience. 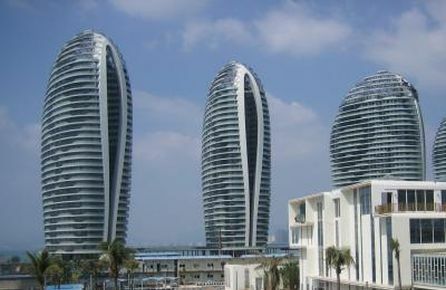 Shenhang Apartment Phoenix Island in Sanya! 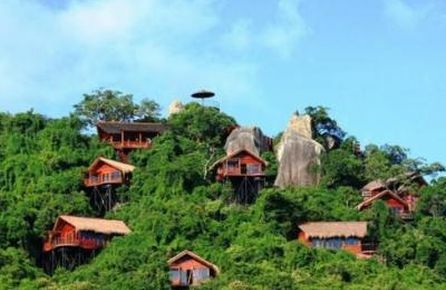 The Mingdao Qixianling Hot Spring Resort is located in a peaceful natural setting in the mountains of Baoting County, 72 km from downtown Sanya. The hotel is the perfect place for guests to escape the busy city and experience fresh mountain air and picturesque scenery in the comfort of a modern hotel. 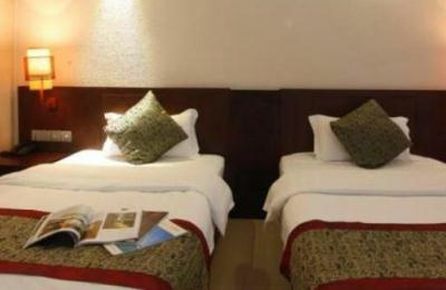 The hotel is also situated 90 km from Sanya Phoenix International Airport. Mingdao Qixianling Hot Spring Resort has 148 comfortable and bright guest rooms featuring elegant contemporary décor and modern amenities. Each spacious room comes equipped with a private bathroom, sitting area, LCD TV, and wireless internet access. Guests will appreciate the hotel's tranquil location, and wide range of features and services, including a fitness center, spa with massages, sauna, outdoor pool, hot spring bath, boat rentals, bicycle rentals, and a casino. The hotel also features two restaurants serving gourmet regional cuisine and international favourites with available 24-hour room service. 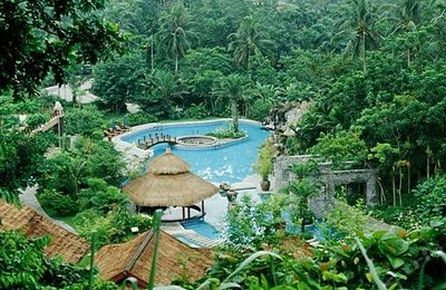 Litchi Garden Rainforest Hot Spring Resort in Sanya! The Narada Resort ? Spa Perfume Bay is located on the beautiful shores of Riyue Bay in the South China Sea, 90 km from downtown Sanya. The hotel offers guests the perfect location to enjoy world-class beaches and escape the busy city. The hotel is situated 60 km from the nearest airport. Narada Resort ? 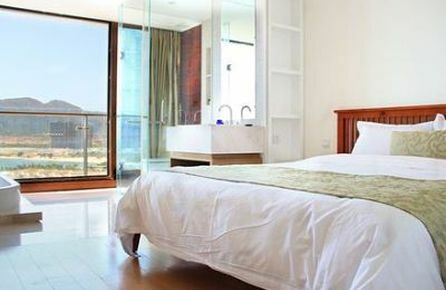 Spa Perfume Bay has 119 guest rooms featuring elegant modern décor, crisp white linens, and large windows. Each bright guest room comes equipped with a private bathroom, LCD TV, sitting area, mini bar, and free internet access. Guests will find no shortage of activities to enjoy during their stay, including fishing, swimming in the indoor or outdoor pools, playing a round on the golf course, gambling at the casino, working out at the fitness center, karaoke, table tennis, and billiards. The hotel also offers an incredible assortment of services, dry cleaning, and guided tours. The two on-site restaurants offer a variety of both regional and international cuisine. Narada Resort Spa Perfume Bay in Sanya! The Summer Coast Resort Sanya Bay is located on the shores of beautiful Sanya Bay in the city of Sanya, renowned for its sandy beaches, scenic views, and family friendly atmosphere. Situated just 4 km from Sanya Phoenix International Airport, the hotel is a short drive from the area's best shops, restaurants, and entertainment in downtown Sanya. Summer Coast Resort Sanya Bay has 99 non-smoking and well-appointed guest rooms, each featuring private bathroom, desk, LCD TV, and complimentary internet access. The hotel offers friendly and helpful staff, and many enjoyable features, such as guided tours of local attractions, on-site shops, airport transfer service, and a restaurant serving delicious regional cuisine. Summer Coast Resort Sanya Bay in Sanya! The Barry Boutique Seaview Hotel Sanya is located on the shores of the Dadong Sea, in the coastal city of Sanya, renowned for its beautiful sand beaches and picturesque views. The 4-star hotel is situated within walking distance to all the shops, restaurants, and entertainment options of downtown, and a short drive from Great East Ocean Plaza. Barry Boutique Seaview Hotel Sanya has 388 comfortable and spacious guest rooms featuring modern amenities and tasteful contemporary décor. Each bright room comes equipped with a private bathroom, sitting area, mini bar, and free internet access. Guests are encouraged to take advantage of the hotel's fine amenities and superior services, including valet parking, private beach, outdoor swimming pool, kids club with games and toys, modern fitness center, and two on-site restaurants offering 24 room service and a variety of regional and international cuisine. 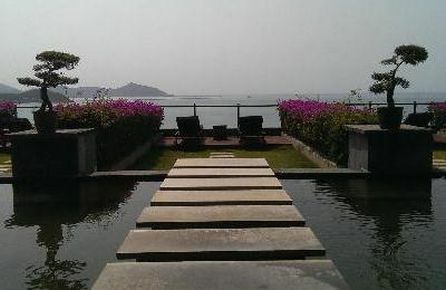 Barry Boutique Seaview Hotel Sanya in Sanya! 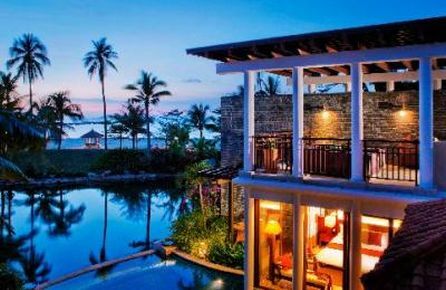 The Yalong Bay Earthly Paradise Bird's Nest Resort is located in the Yalong Bay National Resort District of the city of Sanya: renowned for its sandy beaches, scenic views, and family friendly atmosphere. Nearby attractions include Butterfly Park, Red Gorge Golf Club, Nantian Hotspring Resort, and Yalong Bay Golf Club. The hill-top hotel is situated 10 km from the heart of downtown and 20 km from Sanya Phoenix International Airport. Yalong Bay Earthly Paradise Bird's Nest Resort has 158 comfortable and spacious guest rooms featuring rustic styling and scenic views of the countryside. Each bright room comes equipped with a private bathroom, satellite LCD TV, air conditioning, and free wireless internet access. Yalong Bay Earthly Paradise Bird's Nest Resort features a variety of amenities for guests to enjoy during their stay, including an outdoor pool, spa with massage service, beautiful gardens, fitness center, and a restaurant offering delicious regional cuisine. Yalong Bay Earthly Paradise Bird's Nest Resort Sanya!